Mouse monoclonal antibody is produced from a hybridoma resulting from fusion of SP2/0 myeloma and B-lymphocytes obtained from a mouse immunized with Cetuximab F(ab')2. Recognizes Cetuximab specifically, no cross reactivity with other humanized antibodies. Lyophilized from 0.22 μm filtered solution in 50 mM Tris, 100 mM Glycine, 25mM Arginine, 150 mM NaCl, pH7.5. Normally trehalose is added as protectant before lyophilization. -70°C for 3 years under sterile conditions after reconstitution. Anti-Cetuximab Antibodies on SDS-PAGE under reducing (R) condition. The gel was stained overnight with Coomassie Blue. The purity of the protein is greater than 95%. 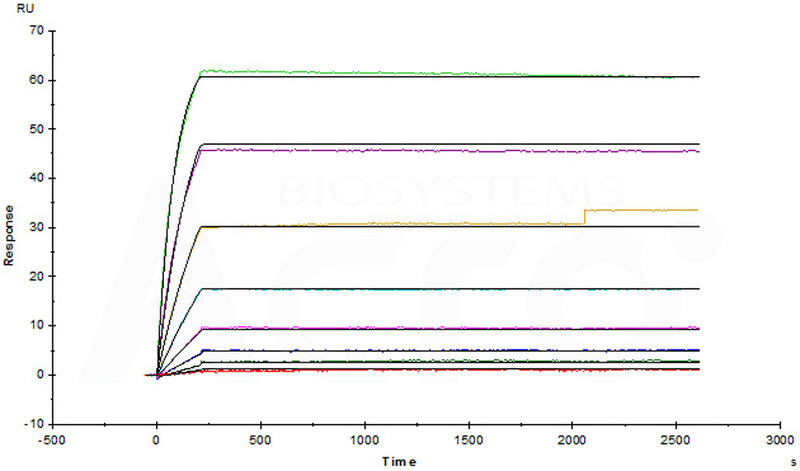 Anti-Cetuximab Antibodies bridging ELISA for Anti-Drug Antibody (ADA) assay development. 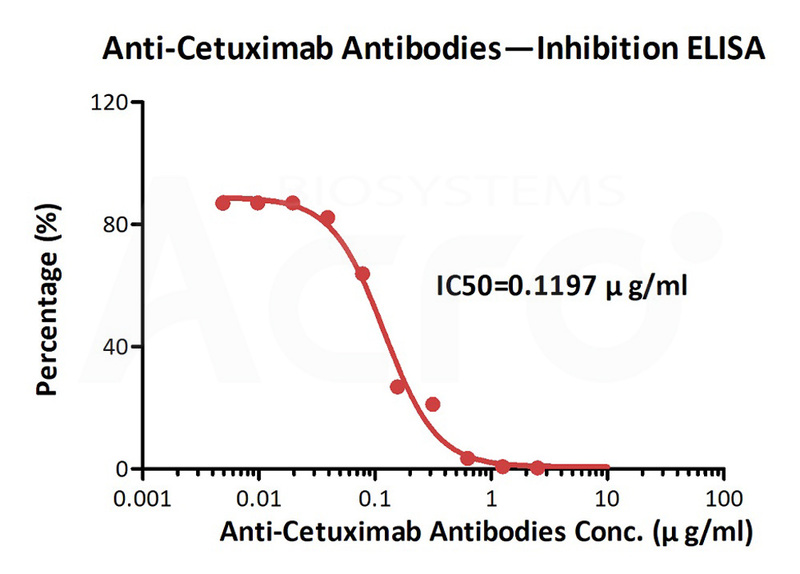 Immobilized cetuximab at 1 µg/ml, add increasing concentrations of Anti-Cetuximab Antibodies (Cat. No. 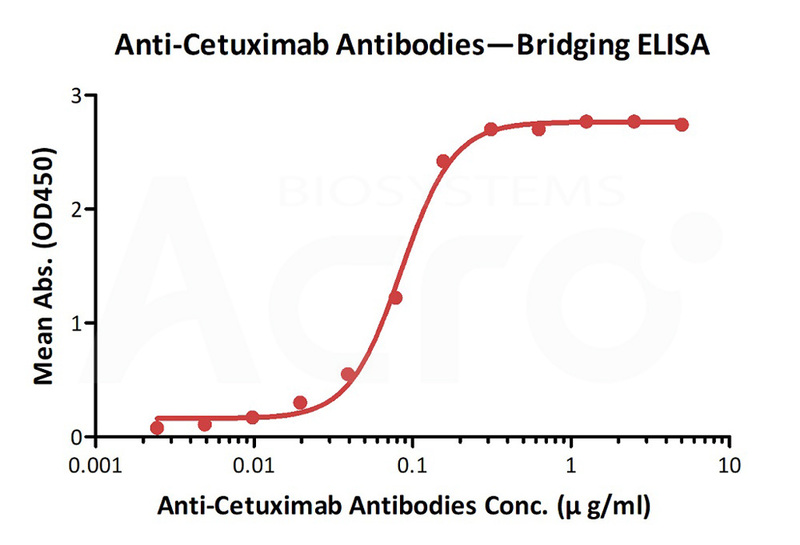 CEB-Y28, 10% human serum) and then add biotinylated cetuximab at 5 µg/ml. Detection was performed using HRP-conjugated streptavidin with a sensitivity of 2.4 ng/mL. 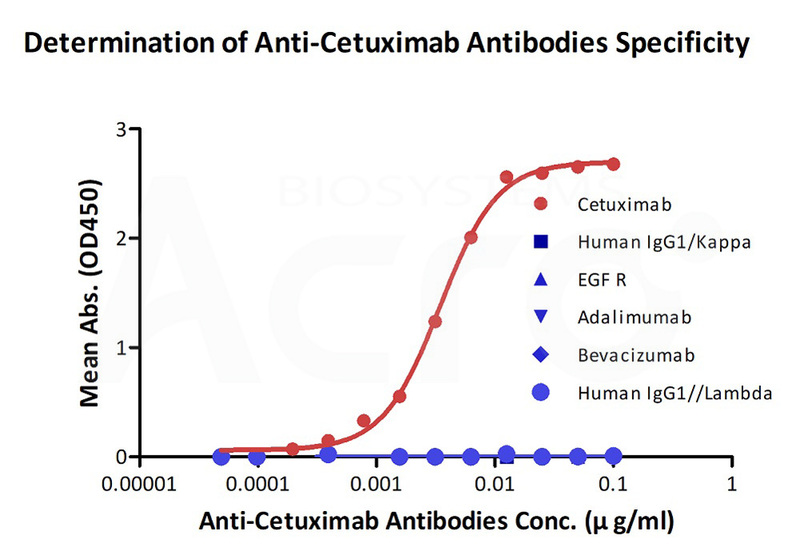 Demonstration of the specificity of Anti-Cetuximab Antibodies (Cat. No. CEB-Y28) to the cetuximab. 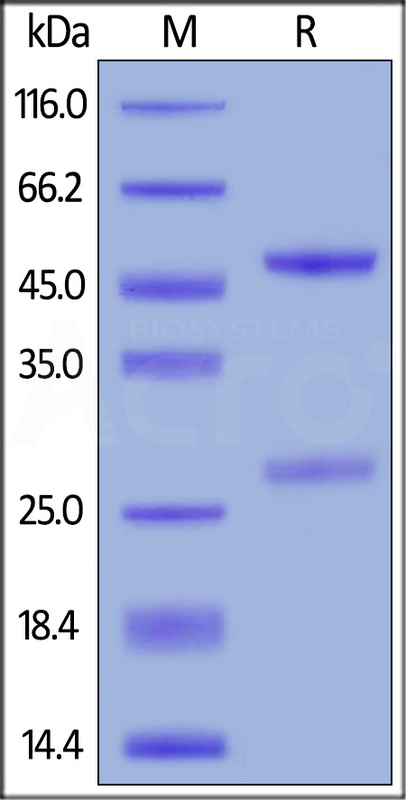 Measured by its neutralizing ability in a functional ELISA. Immobilized cetuximab at 0.2 μg/mL (100 μL/well) can bind pre-mixed Anti-Cetuximab Antibodies (Cat. No. CEB-Y28) and Biotinylated EGFRvIII (Cat. No. EGR-H82E0) with an inhibition rate of 100%. Anti-Cetuximab Antibodies (mouse IgG1, Cat. No. CEB-Y28) captured on CM5 chip via anti-mouse antibodies surface, can bind Human cetuximab with an affinity constant of 1.51 pM. Cetuximab is an epidermal growth factor receptor binding FAB. Cetuximab is composed of the Fv (variable; antigen-binding) regions of the 225 murine EGFr monoclonal antibody specific for the N-terminal portion of human EGFr with human IgG1 heavy and kappa light chain constant (framework) regions.